Some photographers have the rare ability to flawlessly capture a scene through the lens of their camera and create images that are nearly impossible to forget. And Turkish born fashion photographer Irem Harnak, who is known for her work as the photographer behind campaigns for Birdy & Grace, Titika, Joeffer Caoc, Zubaida Zang and Albert Yuen, is one of them. Harnak earned quite a bit of international attention in 2010 when she was selected as the Merit Winner of PDN’s international fashion photography competition, “The Look.” For the competition, which focuses on fashion and beauty imagery, Harnak captured her male subjects in a striking black and white photos series that tells a story of classic mod glamour. 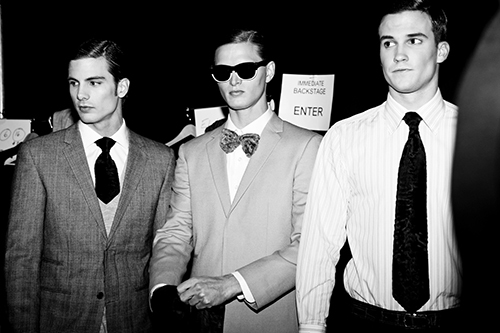 “The photos are of male models getting ready at a fashion show backstage. It is a cinematic capture of the anticipation, stress and boredom of people at a hectic environment of a fashion show,” explains Harnak. Over the years the cream of the crop of magazine publications, such as Marie Claire China, Superior Magazine, Flare, Fashion, Fantastics, 1968, Pause, FAB, Fiasco, The Fashionisto, PRESS the Fashion magazine and many more have all featured Harnak’s captivating work. Whether she shooting high fashion editorials or attention grabbing street-style photographs, Harnak knows exactly how to set the scene and pose her subject in order to create captivating imagery. Her versatility behind the camera is immediately evident when comparing the slew of striking editorials she has shot for the popular Canadian magazine, PRESS The Fashion magazine, over the last few years. In a 2013 editorial for the magazine, Harnak captured Elite Model Katya R. with a visual flavor that screams dark, vintage androgyny. What’s unique about the photos is the way Harnak manages to keep Moore’s feminine side intact, even in the midst of the highly contrasted images and the model’s wardrobe of suits. In 2013 Harnak had another editorial included in PRESS the Fashion magazine, this time depicting model Carly Moore, who’s been featured in Vogue and Harper’s Bazaar on several occasions and has walked the runway for the world’s top designers including Gucci, Calvin Klein and John Galliano. Dressed in high-end Chanel and Dior pieces, Harnak captures Moore looking fresh, edgy and fierce in a black and white spread that undoubtedly caught the attention of PRESS’ readers. Her shots of Eunique from Emer Olsen Models for the ‘Summer Flux’ editorial featured in PRESS The Fashion’s Summer 2015 issue are both fierce and fun. Through her use of a popping tangerine background in the shots of Eunique, who wears a dark hoodie by Silence + Noise and hip sliders by Opening Ceremony, Harnak created the perfect juxtaposition of fun summer vibrance with sporty chic sensibility. “On each story I came up with the mood and did the casting to find the perfect girl that would fit the concept. For that reason it was really liberating and fun,” says Harnak about the editorials she shot for PRESS The Fashion magazine. In addition to being the photographer behind numerous high-profile campaigns, Harnak works regularly with leading Toronto modeling agencies such as Elite, Sutherland, Elmer Olsen, Spot6, Ciotti, B&M and Lang for editorial and commercial work– something that has provided her with the perfect pool of diverse talents when casting for shoots. While the striking editorials Harnak has shot for countless publications over the years have brought her to the forefront of the fashion photography industry, it’s her versatility as a photographer that has made her such a successful and sought after artist. As the photographer behind famous women’s golf apparel company Birdy & Grace’s spring 2014 campaign, Harnak proved her ability to capture commercial print photographs just as easily as she does high fashion. Her shots of Golf Channel’s spokesperson Win McMurry for the Birdy & Grace are stunning and right on point with the classy, upscale Birdy & Grace brand. Over the past decade Irem Harnak has become one of the hottest fashion photographers in the industry today, however her skills are by no means limited to shooting fashion projects alone. Harnak says “being able to capture a cinematic moment” is what drew her to photography in the first place. With that in mind, it’s not at all surprising that with her skill and creativity she has also been chosen to work as the director of photography on several film projects over the years. I like Eunique shot! Harnak really created the perfect juxtaposition of fun summer vibrance with sporty chic sensibility. She is a protean stylist and has her own flexibility and originality.